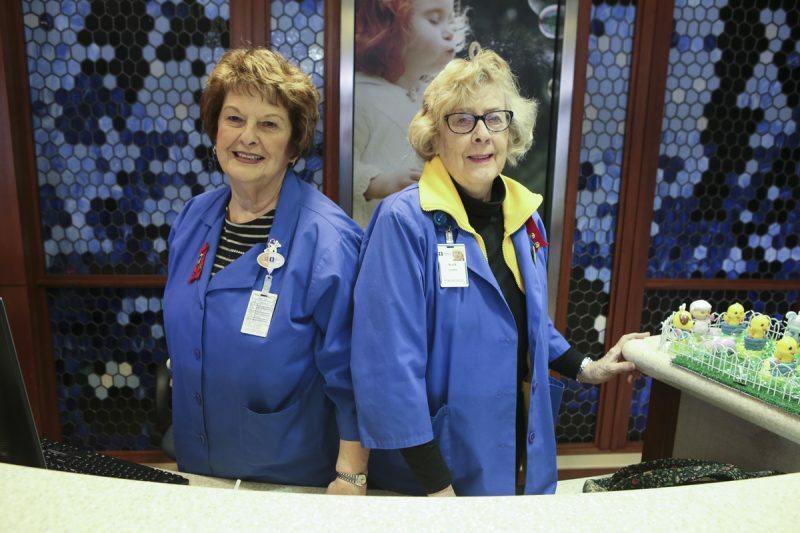 Almost every Monday since the day Akron Children’s Hospital Beeghly Campus opened 10 years ago, local retirees Bernie Zets and Alice Ogden have dutifully staffed the inpatient building’s check-in desk with a smile – and a little assertiveness when they need to. And the 2 volunteers, whose tasks are to greet families and protect the children from unauthorized visitors, thankfully don’t plan on leaving anytime soon. “I will stay here until they tell me I have to go,” Zets said with a laugh. Zets, of Austintown, had just retired from a job as a consumer credit counselor with Family Services and saw a story in the newspaper about Akron Children’s plans to open the Beeghly campus. 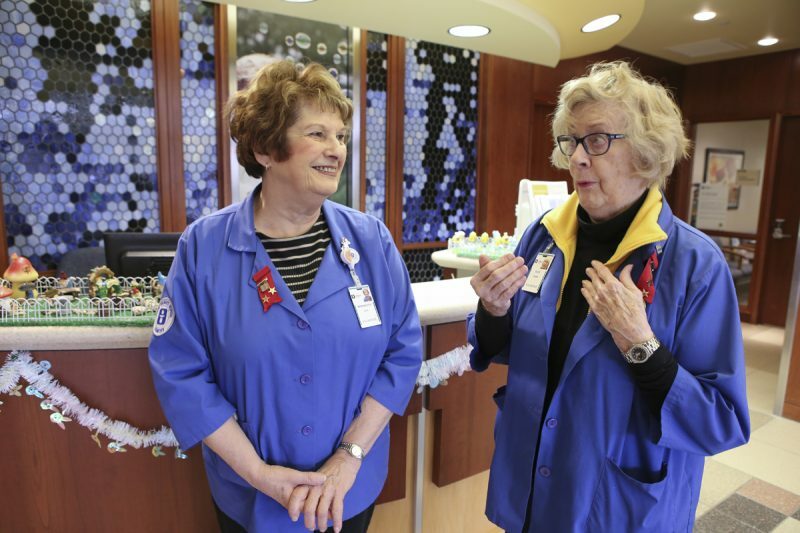 Ogden, from Boardman, was a long-time receptionist for Hill, Barth & King, and joined Akron Children’s after many years of volunteering with different organizations around the Mahoning Valley. “I have always worked with children and I figured you need to give back to community,” she said. Both Zets and Ogden vividly remember the opening of the Beeghly campus in 2008. “It was fun and exciting to see all that was going on. When children arrived, it finally became a real hospital,” Ogden said. Now in its 10th year in the Mahoning Valley, Zets and Ogden say the two biggest moments for the hospital have been the addition of surgical procedures and the recent expansion of Building A, which centralized several sub-specialties into the Beeghly campus. Additionally, both ladies attribute the local hospital’s success to the compassionate care and dedication from everyone on staff. As they reflect on their time volunteering at the Beeghly Campus, both ladies feel an immense amount of pride in giving back to children and their families. “We get so much more from it than money,” Ogden said. “I have met some wonderful families from being here and it feels good to tell people I volunteer at Akron Children’s Hospital,” Zets says. Interested in becoming a volunteer at Akron Children’s Hospital? There’s a role for everyone. Click here or call 330-746-8350 to learn more about open positions.